FastFeed is a series of iOS app that provides the multi-tab navigation for various social network services. FastFeed is currently available for Tumblr, 500px, Facebook and Flickr. Do you remember the thrill when you first used the multi-tab in web browser? It removes the burden of managing windows and gives you a freedom of navigation. The same thing occurs here. FastFeed brings multi-tab to mobile app navigation. This will remove repetitive back operations and give you a seamless content flow. No more ‘Select->View->Back’, just ‘Select->View’ and ‘Select->View’. Multi-tab bar is located at the bottom of the screen and supports auto-hiding. Although it contains powerful functions, it is designed as tiny simple bar. Moreover, it will disappear when scroll down. Accordingly, content view is enlarged to the entire screen, the largest content size as possible. This leads to the best environment to concentrate on content. Content is displayed either grid or detail layout. Grid is best for fast scanning. Detail layout is optimized for full-sized content viewing. Two layout are easily switchable by simple tap/swipe gesture. Layout switch always preserves the current viewing position. Multi-tab bar caches last viewed position and layout state. In FastFeed, every content is seamlessly connected and naturally flows. From the version 2.0, FastFeed offer a new feature ‘FeedSet’. In a social world, following is inevitable. But as we follow more, our home feed get easily overcrowded. FeedSet is a elegant solution to this problem. Instead of reducing follow, create a separate collection of blogs containing only the users that you want to see. You can add up to 20 feeds in a FeedSet. Any feed can be added even if you are not following them. You can create FeedSets as many as you want. With the FeedSet, you can put your daily reading in order, while keep your following unconstrained. FastFeed combines the powerful multi-tab navigation with the simple and intuitive UI. This unique UI can apply to any feed service. First, we show it with FastFeed for Tumblr. And next we proceed for Instagram, 500px, Facebook Pages and Flickr. With the FastFeed, you can enjoy the best app experience ever. Stay tuned on FastFeed. Multi-tab: Each feed is opened on a new tab. The tab has menus such as ‘Close This’, ‘Close All But This’ and ‘Tab History’. It also supports auto-hide/restore. Grid/Detail Layout: Grid for fast scanning, Detail for full size content viewing. You can switch both layouts easily by tap/swipe gesture. FeedSet: You can create a custom collection of feeds. Smart Paging: Scrolling stops at the beginning of a nearest content. Fullscreen image viewer supports endless scroll of all the photos in a feed. Slide show also supported. 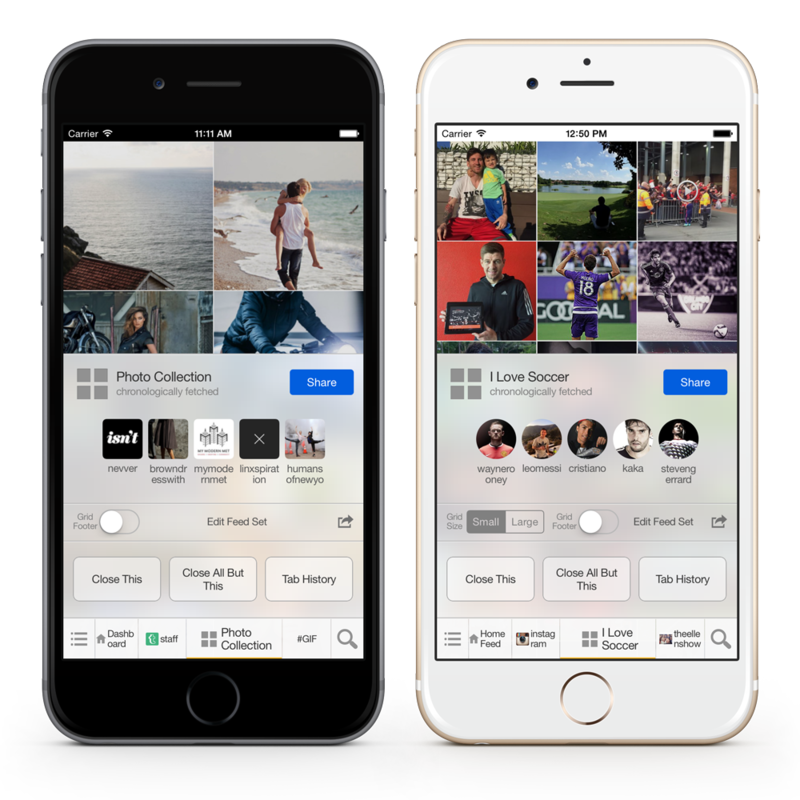 Flexible content layout supports both portrait and landscape orientation. Universal app for both iPhone and iPad. Support iPad multitasking(Slide Over, Split View, PIP). This app is for Tumblr Service. It’s renamed and the former title is ‘FastFeed for Tumblr’ and ‘FastFeed T1’. Can post any type of content: photo, video, quotes, chats, links and text. Offline posting – you can post anytime. Known limitations: ask/reply, fan mail, notifications, tracking tags are disabled. (not provided by Tumblr API). Popular Pages list on explore menu. All FeedSet features are available for free. Repost: You can repost any image and video. Clean look and various options (layout/color/blur) are available. Photo Map: Explore photos with map. Known limitations: New posting,commenting is not allowed (by Instagram API). Notice: FastFeed for Instagram discontinued due to Instagram policy change. See following links for more detail, notice and another notice. Photo feed supports ‘category’ filter. Tap the category title at feed menu. Search photos by keyword or tag. Supports sorting the result by rating or recent. Offers an option for ‘Local NSFW Setting’. It can override the account setting. Known limitations: Photo upload is not supported. FastFeed for 500px is intended for viewer only. Photo Map: You can view the photos over the map for each feeds. Explore Map: You can browse photos on the map. It locates at the right explore menu. Known limitations: Photo upload is not supported. FastFeed for Flickr is intended for viewer only. You can use all the features freely without any extra cost. But it also offers in-app-purchase options such as Ad-remove-upgrade. FastFeed is available only on iOS currently.